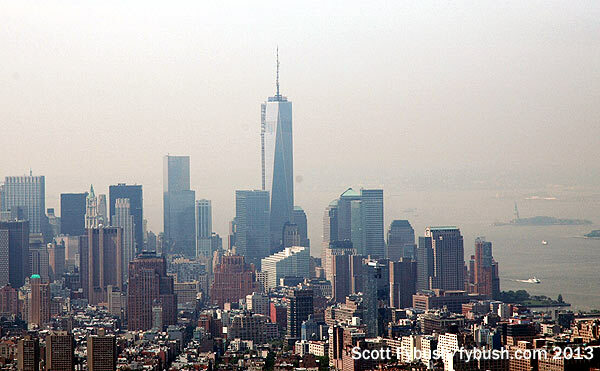 *As another milestone anniversary of the September 11 attacks came and went in NEW YORK over the weekend, perhaps the most remarkable conclusion we can offer in our fifteenth-anniversary update is how little there actually is to update. 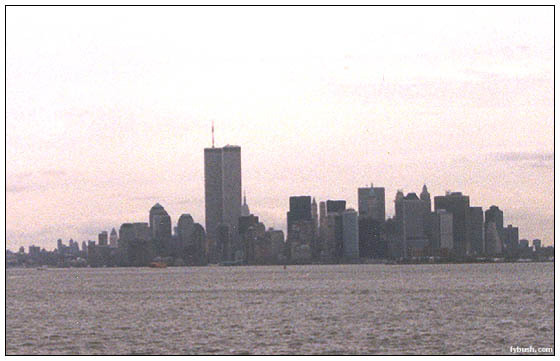 Over the weekend, we reposted the “9/11 Plus One” article that first appeared in this space in 2002, and in doing so we were struck by how optimistic we were back then about the prospects for an improved reconstruction of the broadcast facilities that were destroyed on that terrible September day. 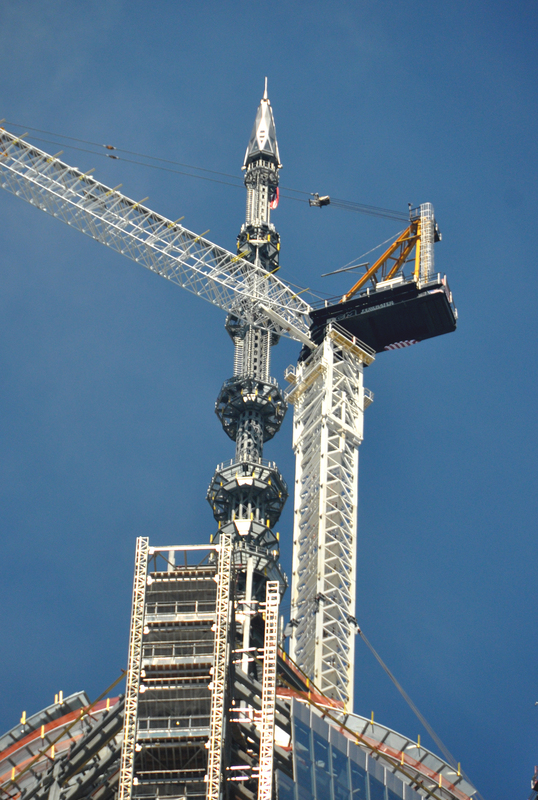 At the time, we thought, it would be “no more than a year” before construction was underway – or even complete – on a new tower that might return New York’s TV signals to the heights they’d occupied on the old 1 World Trade Center. Instead, in a way we could hardly have anticipated back then, a combination of political delays, technical holdups and transformations of the entire broadcasting landscape have left the situation not that much different from the way we left it back in 2002. At the time, the Empire State Building had been pressed into service as a makeshift replacement home for most of the city’s TV stations, most of them returning to the building they’d abandoned in the 1970s to get a few hundred more feet of height from the new Trade Center site. Today, all but one of the former Trade Center TV signals now broadcasts from Empire, where millions of dollars have been poured into reconfiguring the antenna mast and transmitter rooms while avoiding disruption (as much as possible) to the other FM and TV signals that were already using Empire. Within the building, former office space on floors 77, 78 and 79 was reconfigured in the years after 9/11 to carve out new transmitter rooms for the stations that needed it. An initial round of antenna reconfiguration for analog TV gave way, as the 2009 switchover approached, to a more comprehensive set of antenna changes that included master antennas for both high-band VHF and UHF digital TV on the mast. In the meantime, TV broadcasters increasingly seem to have found that “good enough” is good enough. Initial hopes for a 2000-foot super tower in Jersey City faded in the years after 2002, done in by high costs, FAA opposition and, more than anything else, a sense that with more changes yet to come in the TV landscape, a massive investment in over-the-air infrastructure might not be warranted. Uncertainty over the future has also kept progress slow at the replacement for the super tower project. Once political obstacles were cleared out of the way and the new 1 World Trade Center tower began to rise from a site next to the old one, developers have found broadcasters slow to sign on to the new project. For that, we can blame larger factors – the combination of the FCC’s spectrum repack efforts and the eventual conversion to the new ATSC 3.0 standard mean broadcasters don’t want to invest in building out expensive new transmitter sites on channels they may not even be using within a few short years. But if progress has been painfully slow when it comes to broadcast development, it’s been on fire when it comes to skyscraper development in general around Manhattan. The Empire State Building (and even more so the somewhat shorter Four Times Square to its northwest) are gradually being dwarfed by skinny, shiny newer buildings that have been poking past the thousand-foot mark. Those new towers don’t carry broadcast antennas – developers can make more these days by filling top floors with residences that cost many tens of millions of dollars – but they do present the possibility of new multipath and shadowing issues that are making some broadcasters quietly leery about making big new investments at Empire. While nobody will say so for the record – the fight for broadcast contracts has become both lucrative and intensely secretive – those concerns have no doubt contributed to slowing progress on a new FM antenna system at Empire as well. Amidst the glitz of the celebration last fall of the 50th anniversary of the original Alford antenna system, it went largely unremarked that the current ERI master antenna has now been in use for almost three decades, longer than the Alford saw primary service. With the migration of most of the former World Trade Center FMs to Empire after 9/11, that ERI antenna and combiner is carrying a lot of weight these days: 16 full-power commercial FM stations depend on it for what’s estimated to be close to half a billion dollars in annual revenue; three more FMs share the “mini-master” that adjoins it on the mast. Behind the scenes, the lessons of 9/11 are still being learned by broadcasters. Robust backup facilities are still not as universal as one might expect, but they’re at least more common than they were 15 years ago. Not just in New York but in most major markets, big operators such as iHeart and CBS Radio routinely maintain off-site backup transmitters and studios that would give them much more ability to keep broadcasting if another tragedy like the one in 2001 were to hit. But complacency is dangerous – and as we remember the broadcasters who gave their lives atop the World Trade Center, Rod Coppola, Steve Jacobson, Isaias Rivera, Bill Steckman, Don DiFranco and Robert Pattison, we hope their memory and the lessons of that terrible day will not be forgotten. *There were two big post-Labor Day bombshells that we reported in our NERW Extra last week: RHODE ISLAND Public Radio’s big-name hire of former WBEZ (91.5 Chicago) leader Torey Malatia to be the Ocean State outlet’s new general manager – and the Meredith/Media General merger, which will have huge consequences in western MASSACHUSETTS and CONNECTICUT. Until Malatia settles in at RIPR, there’s not that much more we can add to that story, but there’s a lot more that we can tell you this week where Meredith and Media General are concerned. We covered the basics in our Extra: in the Springfield market, Media General’s NBC/CW WWLP (Channel 22) and Meredith’s ABC/Fox WGGB (Channel 40) and CBS WSHM-LP (Channel 21) combine to form the entire commercial TV landscape. In Hartford/New Haven, Media General’s ABC WTNH (Channel 8)/My WCTX (Channel 59) and Meredith’s CBS WFSB (Channel 3) compete with NBC’s WVIT (Channel 30) and Tribune’s Fox WTIC-TV (Channel 61)/CW WCCT (Channel 20). It’s a given that the merged MG/Meredith will have to shed stations in those markets, as well as in four others (Nashville, Greenville/Spartanburg/Asheville, Norfolk, Portland OR), to stay within FCC ownership caps and to keep the Justice Department’s Antitrust Division happy. *With the departure of most of Boston TV’s star anchors from the 1980s and 1990s, Maria Stephanos was one of the last really big names on Hub TV. So when the 18-year veteran anchor at WFXT (Channel 25) announced last week that Friday would be her last day on the 6, 10 and 11 PM newscasts, the market was buzzing. *Is there an HD Radio in the Popemobile? We’re guessing no – but the papal visit will have two full-time formats covering it when Francis gets to PENNSYLVANIA later this month anyway. CBS Radio had already launched the “Popecast” on WZMP (96.5 Philadelphia)’s HD3, and now iHeart is joining the crowd with the announcement of “Pope Info Radio,” which launches Sunday (Sept. 19) on WDAS (1480) and WISX (106.1)’s HD2. The iHeart Pope format will displace smooth jazz “JJZ,” the remnant of the old 106.1 main-channel format. On TV, meanwhile, Time Warner Cable News will be doing 24/7 Pope coverage on channel 199 on most of its systems, using coverage from its NY1 channel and broadcasting nonstop from Papal events when NY1 itself cuts away to other news. *From the moment sports talk began spreading to FM a few years back, the rumor mill in MASSACHUSETTS has been churning: when will Entercom migrate WEEI, one of the nation’s most consistently successful sports outlets, from 850 on the Boston AM dial to a new home somewhere on FM? It didn’t happen five years ago, when Entercom added another FM signal (now WKAF 97.7) to its Boston cluster. It didn’t happen two summers ago, when CBS upped the Boston sports ante by launching its own FM sports entry, “Sports Hub” WBZ-FM (98.5). It didn’t happen later that fall, when the collapse of “ESPN Boston” WAMG (890) made the ESPN Radio affiliation available, nor did it happen a year later, when another rumor made the rounds about Entercom buying WFNX (101.7) as part of a deal that would have shifted WEEI to FM. But at 6:00 this morning, it’s happening. As we learned Wednesday evening (and officially on Thursday morning) Entercom is pulling the plug on adult hits “Mike” (WMKK 93.7 Lawrence) today and flipping that FM signal to sports as WEEI-FM. At least for now, WEEI will simulcast on 93.7 and its existing AM 850 spot; around the region, Entercom will shuffle callsigns to make the WEEI-FM move possible, turning the current WEEI-FM (103.7 Westerly RI) into WVEI-FM and the current WVEI-FM (105.5 Easthampton/Springfield) into WWEI. *The week’s other massive story, of course, was the monumental flooding that devastated parts of central PENNSYLVANIA and NEW YORK‘s Southern Tier. For radio and TV stations in the region, the flooding provided an opportunity to demonstrate, in a dramatic way, the importance of broadcasting in keeping the public safe and informed, even as the floodwaters threatened broadcast facilities all along the Susquehanna River and its tributaries. Several stations in low-lying areas were forced out of their studios as the waters rose: in Owego, west of Binghamton along the banks of the Susquehanna, the storefront studio of WEBO (1330) was inundated – but owner Dave Radigan and his staff quickly regrouped, turning a borrowed RV parked at the transmitter site just south of the river into a makeshift studio running on generator power and providing about the only source of constant information about road closures and power and water outages for hard-hit Tioga County. As we write this week’s column Sunday night, there’s even worse news: WEBO’s downtown studios, in the storefront of a century-old building, have been condemned due to problems with the building’s crumbling foundation that reportedly have the first floor on the verge of collapse. Dave and his crew (including contract engineer Mark Humphrey) managed to get most of the station’s gear out of the building undamaged, but it will be a challenging few months ahead as WEBO moves first into a temporary studio this week and then seeks new permanent digs on higher ground. *Radio One completed its format swap in Philadelphia last week: with adult R&B WRNB now installed on the cluster’s biggest signal, the Media-licensed class B facility at 100.3, the former home of WRNB has picked up the hip-hop format that used to be on 100.3. WPHI-FM is now at 107.9, the Pennsauken, N.J.-licensed class A signal that transmits from the One Liberty skyscraper in Center City Philadelphia, and as of Friday it’s now “Hot 107.9,” with Sarah O’Conner as PD and the syndicated Ricky Smiley show in morning drive. The hotter music mix comes with new call letters as well: the station has become CKBE. *Over on the AM dial, our Labor Day update already brought you the news of Cogeco’s decision not to wait for the CRTC to decide whether it can relaunch the old CINF (690) as a French-language all-traffic station. With the powerful lure of $1.5 million a year in provincial transportation ministry funding dangling in front of it, Cogeco pulled the plug on French-language sports CKAC (730) last Tuesday, replacing it with traffic as “Radio Circulation” and moving some of CKAC’s sports hosts to talker CHMP (98.5), now the only commercial mainstream spoken-word signal broadcasting in French in Montreal. The TV dial in southern MAINE will be doing some serious spinning on October 7, with some help from Pegasus Broadcasting. After more than a decade as a Fox affiliate, WPXT (Channel 51) in Portland will drop that affiliation in favor of the smaller WB Network, seen until now on LMA partner WPME (Channel 35) in Lewiston as a secondary affiliation. The move appears to be a Pegasus corporate decision, with fellow Fox affiliate WDBD (Channel 40) down in Jackson, Mississippi making the same switch on the same day. Why? NERW suspects an attempt to reap more affiliate compensation from Fox, which will now be left with no broadcast outlet anywhere in the Pine Tree State. To fill the gap, Time Warner has already announced that it will pick up the national FoxNet feed, which will appear on cable channel 14 for customers in Portland and vicinity. Elsewhere in the state, Fox will now have to negotiate with smaller local cable companies for carriage (most had been picking up WPXT via microwave relay for years). And for viewers without cable, it looks as though they’ll have to get used to life without Homer, Scully, Ally and half the Sunday NFL schedule (unless, of course, other Maine network affiliates strike deals with Fox to pick up some of the network’s sports). The big news in the Granite State over Labor Day came courtesy of a Massachusetts broadcaster: Ted O’Brien, the veteran news voice of WNAC-TV, WRKO, WABU and now WBUR-FM (90.9 Boston), who went hiking in the White Mountains on Sunday (Sept. 2) and didn’t come back right away. A search that lasted through two nights ended Tuesday morning when O’Brien was found, tired but safe and apologetic about his unintentional adventure, which began when he wandered off the trail over Attitash Mountain. O’Brien admitted he wasn’t properly prepared for the hike and had failed to anticipate how long it would take. And radio people being radio people, we hear his return to WBUR later in the week found a mock press release attached to his computer, announcing O’Brien’s appointment as head of the Boston University branch of the Appalachian Mountain Club! All kidding aside, we’re as relieved as anyone else to be able to report a happy ending to this story, which sparked a brief holiday-weekend media circus in Boston. Hundreds of mourners turned out Wednesday afternoon to remember Boston radio legend Sunny Joe White. The 42-year old veteran of WILD, WZOU, WVBF, and most notably WXKS-FM was found dead in his Boston apartment last weekend, apparently of a heart attack. White came to Boston in 1977, near the beginning of a radio career that started at little WGIV in his native Charlotte, N.C. After two years at urban WILD (1090), White joined Rich Balsbaugh and the rest of the team that was launching “Kiss 108,” WXKS-FM in Medford. First as morning jock/PD and later as evening jock/PD, White helped shape the disco sound that pushed the former WWEL-FM from worst to first. White’s later career was checkered, marred by frequent allegations of drug use (which the Boston Herald’s Dean Johnson had the guts to mention in his obit) and a variety of stints at several smaller stations. After leaving Kiss, White spent some time programming and consulting rival CHR WZOU (94.5, now WJMN). The early 90s found him doing evenings on WVBF (105.7) during its “Boston 105” phase. That gig ended when WVBF became country WCLB in early 1993, and White left local radio for a time. He was just starting to make a comeback at the time of his death, with consulting and on-air work at WILD, and rumors of a new partnership with Balsbaugh to start a brand-new radio group. White was remembered Thursday night with an hour-long special on Kiss-108, which your NERW regrettably missed. I’d be interested in hearing from anyone with a tape of that broadcast. The Cape Cod airwaves just keep shifting ’round, and the latest changes come at the top of the dial. Classical WFCC (107.5 Chatham) was recently purchased by Charles River Broadcasting, and as of this morning, WFCC’s entire air product is emanating from Charles River’s WCRB 102.5 Waltham-Boston. It’s not exactly a simulcast; though both stations will be playing mostly the same music with the same hosts, the on-air product will be customized for each station. WFCC goes 24 hours as a result of the change (the station used to sign off at midnight daily), and both stations get a new DJ lineup. Laura Carlo moves from afternoon news duty to mornings, working live 6am-noon and on tape from noon till 1. Ray Brown moves from mornings to afternoons, working the 1pm-7pm shift. And Larry King (a different one!) will be heard 7pm-6am, with overnights on tape. WFCC’s former airstaff has been offered work as salespeople for WCRB. I can add that the new downtown Poultney VT signal (92.5) is a relay of WCKM Glens Falls.